that has made it one of the most dynamic economies of the last forty years. Bunsha means company division. In practice in means routinely spinning off companies from the core group. Co-founder of one of Japan's foremost high-tech manufacturing groups, Mr. Kuniyasu Sakai has spent nearly half-a-century building more than forty stable and profitable companies. Sakai's experience as a successful manager of a large group of small companies led to the development of his business philosophy known in Japan as Bunsha, or "company division." Kuniyasu Sakai and his partner, Hiroshi Sekiyama, are legendary managers in Japan. They don't buy the "bigger is better" concept. Kuniyasu Sakai and Hiroshi Sekiyama started a business together in the aftermath of World War II. Over the next few decades they turned it into a → highly profitable business. Rather than build a single, giant firm, they divided it, and then kept on dividing. Always keeping each of their firms at its optimum size. In the process of creating a prosperous Bunsha group of companies, they discovered how to keep their companies on the cutting edge, their employees productive, and their clients happy, all at the same time. Their method is what Mr. Sakai calls bunsha (literally, 'dividing companies'), a system he and Mr. Sekiyama developed over more than 40 years of real-world corporate management. They created a group of more than 40 thriving, independent, high-tech manufacturing companies through bunsha (company division). Once a company is "successful," they fear that bureaucracy and complacency will set in. What do they do? They divide it. Neither an academic theory, nor some uniquely-Japanese management concept, (Mr. Sakai urges managers to forget about studying theories and get back to doing what they do best: managing their companies), Bunsha's message is not merely one of improving corporate profit through downsizing, it is also a format for → improving the lives of each and every employee, increasing both worker and manager motivation, as well as a viable plan for the rapid revitalization of any company. According to Sakai, "Splitting up is like analyzing them under a microscope. When you look at the sections you can see waste inherent to the old-style approach of large companies. 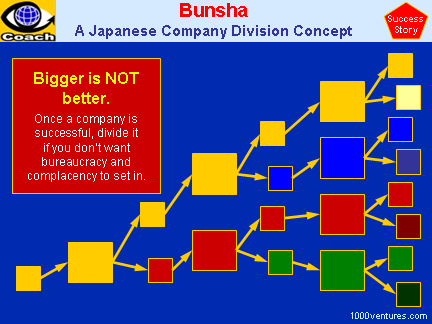 Creating divisions is not sufficient; the sections have to become separate companies: that is the key to bunsha philosophy. Being separate allows them to become more efficient. For example, even the cost systems have to be allowed to differ. Under the divisional structure, all get the same cost system; it's a bit like everyone buying suits with the same sleeve length. Under the bunsha philosophy, every company can develop its own cost systems so they fit perfectly." In his book To Expand, We Divide, Mr. Sakai further explains his "smaller is better" management philosophy by responding with common-sense and practical solutions to questions from managers who are either beginning the process of company division, or considering changing their system of business. Those with long-term → vision are invited to consider and adopt Sakai's simple program of Bunsha originally developed and set in motion to insure that his own company would prosper in future. Once a company is successful, divide it if you don't want bureaucracy and complacency to set in. Give each company a full complement of functions. Critics say that it is not economical to duplicate accounting, personnel, and other functions within a group. But in the information age, centralization limits data collection and personal contacts. If each company has its own information networks, in combination they will have access to more information than any other group of companies. Pick → Capable Leaders , then stand back and let them lead. Give them enough start-up capital in the beginning and, more importantly, the people they want to work with. Customer lists can be divided up, or the units can compete head to head for customers. The new leaders must in turn create an atmosphere in which employees can contribute through suggestions, → experimentation, etc. Expect mistakes. As long as they are learned from, they should be viewed as progress. See bunsha as a means to alleviate unemployment and promote → Entrepreneurship . In an era of massive layoffs, why not give employees an opportunity to start a new company, with all the inherent risk and exhilaration involved, rather than the proverbial pink slip? Bunsha is like tapping into the fountain of youth. Even older managers are rejuvenated by the process of starting over. Remember that small entities are more likely to adapt and survive rather than expect the environment to adapt to them. Newer entries are less likely to fail into the trap of following outdated procedures simply "because we've always done it this way" and thereby can be more responsive to changing customer demand.